Hazel Hudson has finished her third book about Wedmore. Hazel added to provide context for the pictures. 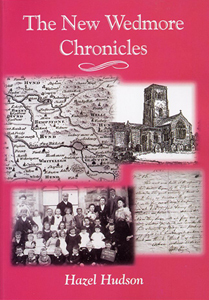 Hazel's new book, called "The New Wedmore Chronicles"
titled "Wedmore Past. A Pictorial Record Of Wedmore Parish" and "More Wedmore Past." which contain all kinds of photos and drawings dating from the mid 1800's to the mid 1900's. These books are a must for anyone with family from this great village. Information on how to purchase the books can be found at the bottom of this page. If you are going to be visiting Wedmore, make sure you check out Hazel's walking tour brochures. They are a great way of learning about Wedmore. They take you through different parts of the village, pointing out interesting facts about various things you'll be looking at.